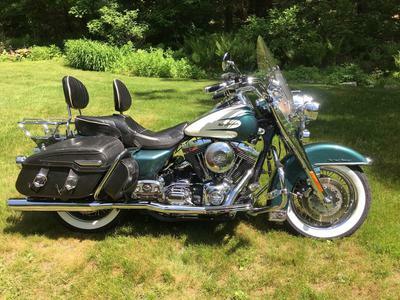 The 2002 Road King Classic for Sale is a completely re-done 2002 Harley Davidson Road King Classic that comes with loads of accessories and upgrades. I am holding a clean Title In Hand. 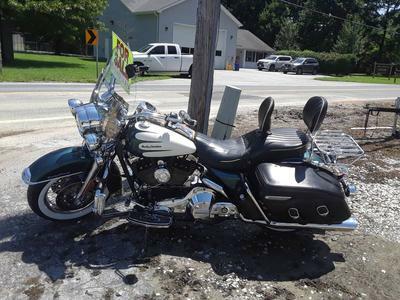 The Road King has always been kept garaged And Maintained the owner and is in great Shape. The motorcycle has a distinct vintage look to it as well as a tasteful custom Paint Job on the Fuel Tank. '02 HD Road Kings and you will see that mine outshines them all! Mine has lots of features others lack. Upgraded Smooth Rims With Spokes. Mustache Style Engine Guard with Highway Pegs. Upgraded Headlight and Passing Lights. 95" Big Bore Rebuild with Wiseco Flat Pistons and Wiseco Rings. Baker "Direct Drive" 6 Speed Transmission! Barnett Clutch With Easy Pull Kit Installed. 1 yr old Progressive Rear Shocks And Recent Front Fork Rebuild. Fuel Injected With K&N Cold Intake. 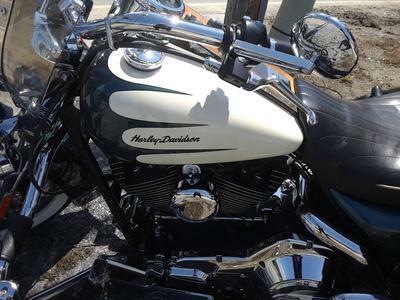 This used Harley for sale is By Far A Very Beautiful Machine and The Best Running Road King I Have Ever Ridden. It runs Strong With Lots Of Power and Rides Like A New Machine!!! Added Turn signal Indicator on Triple Tree. Harley Factory Service Manual for a 2002 Harley Davidson Road King. If You Are In The Market For A Really Nice Touring Hawg Give This mine a Look. This Is A Must See Must Ride bike you will Appreciate! Mileage is 83K, Mostly Highway Miles. It Has Been Comfortably Driven To The Outer Banks North Carolina From Massachusetts 2 To 3 Times Per Year In The Last 16 Years and is ready For Your Long Or Short Road Trips. I would not hesitate to ride this Bike Coast To Coast Without A Second Thought! 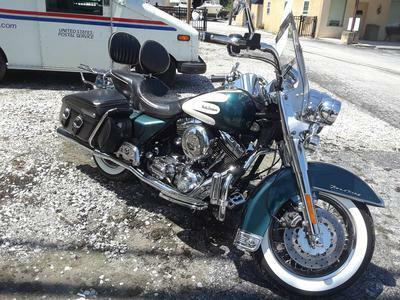 The 2002 Road King Classic for Sale is in Essex, Maryland (USA) and my price is $6900.00 Firm and it is a Steal At This Price! I may also Consider Trades Of Equal Value. (RV's, Rollbacks, Classic Cars, Diesel Trucks, Etc. Send me what you have using the comment form below provided by GoGoCycles Used Motorcycles for Sale. Join in and write your own page! It's easy to do. How? Simply click here to return to HARLEY DAVIDSON ROAD KING CLASSIFIED AD INVITATION.